Do you ever think back to what life was like before the internet? Before we could dash off an email to a friend, quickly settle a debate about whether it was John Corbett or Paul Rudd in some movie (seriously, they don’t even look alike, how do I confuse them? ), or scroll through Pinterest for hours to be inspired? 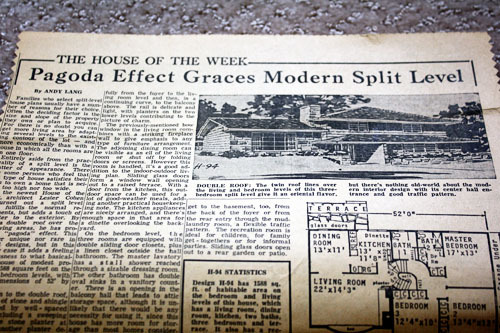 A bunch of fifty-year-old newspaper clippings of the House of the Week, cut from the local paper by my teenage mother! See, I get my love of household design honestly. Must be genetic. This is what you did before Pinterest, people. 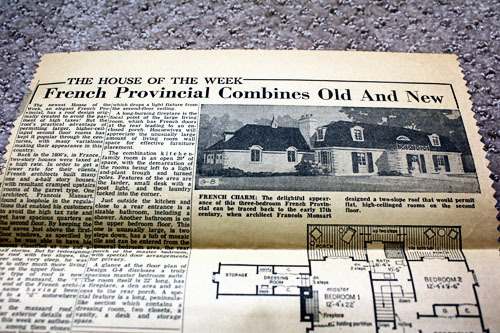 You cut out half-page articles of house plans from the local newpaper, once a week. With pinking shears, for extra craftiness! 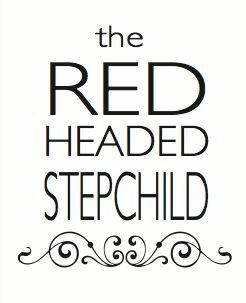 Clearly, I adored flipping through my mother’s version of a household-themed Pinterest board. So I thought I’d share the fun with you! 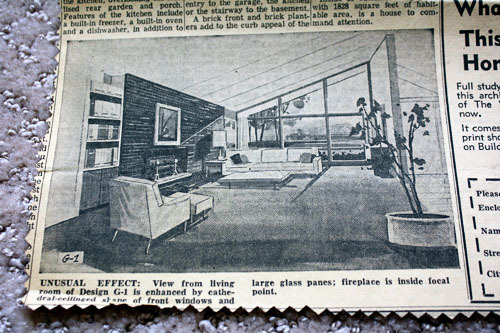 For starters, I got a kick out of how they’d claim a classic architectural style for a house that was so very clearly designed in the 1960s. This may be called “French Provincial”, but today there is definitely a bit of “That house is totally fifty years old”, too. I also like how they claim this split-level is a pagoda. You could avoid the “classic”, of course, and go for modern... which is also totally trendy. 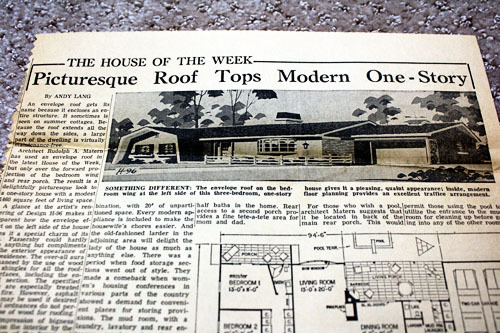 Check out the “modern” and “picturesque” envelope roof! I also loved the angled sidewalk in this house plan. “Interesting” indeed! Interesting enough that architects were apparently tired of it in a matter of years, thus relegating an angled sidewalk to a very specific point in house-buiding history. Isn’t it humbling? For all my attempts to embrace “classic” designs and “interesting” features, no matter what, I’m sure I’ll look at photos of our carefully curated home in twenty years and see nothing but a snapshot of the trends at the time. 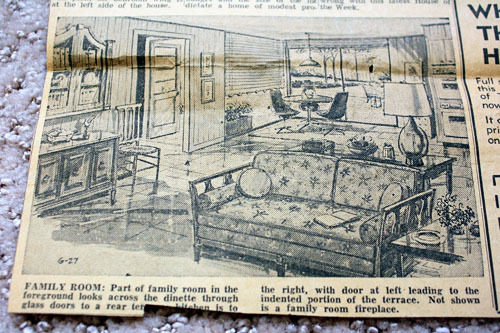 And speaking of interiors, the house plans provide those too! Who doesn’t want a sunken living room with “modern” banister and built-in planter? Or a more “traditional” style (again, everything being relative). Not sure how traditional floral sofas with wooden arms are. The pinch-pleat curtains, the drum shade, the straight lines! And funnily enough, today you can still get a chair in that shape at IKEA. Other drawings show a style that’s definitely from the era of the Mod Squad, but is nevertheless embraced today, in both retro and updated forms. I can think of several new-build homes with angled cathedral ceilings. And of course, more IKEA furniture for you. 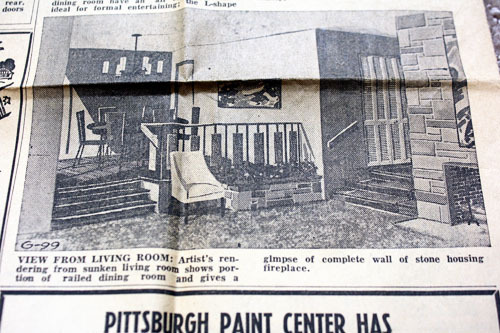 But what I really, truly loved about the articles – a love I’m sure I share with my mother – was the floorplans. Gosh, I love floorplans! I used to collect them as a teenager, too. Although I had the internet, which meant I could spend hours studying them. And then I would bust out the graph paper and draw my own! 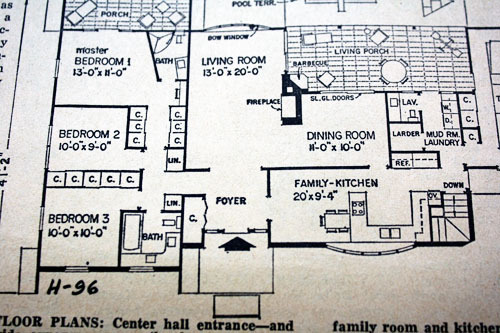 Please tell me I’m not alone in my absurd obsession with floorplans. 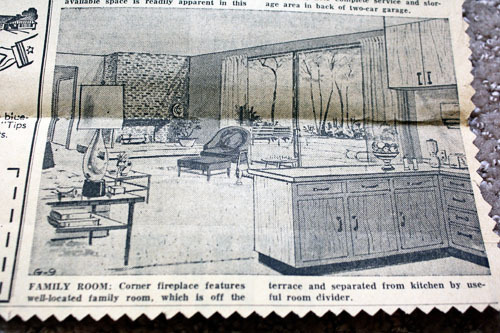 In any case, these floorplans are yet another study in Then versus Now. I thought the room sizes in this home were a bit compact but reasonable for a modestly-sized new house today... until I saw the six-foot-wide kitchen. No one today would intentionally choose a six-foot-wide kitchen. The countertop space in that picture makes me sad. And I got a kick out of this octagonal living room. What? No. How do you even place furniture in a room like that? Finally, I quite liked this floorplan at first glance. 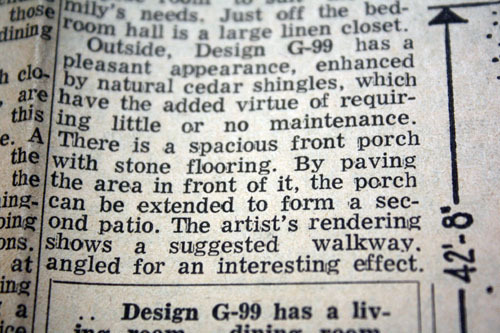 But then I noticed the kitchen off the entryway... that weird angled wall in the master suite... and sorry, a “larder”? A quick google search reveals that a larder is a pantry. 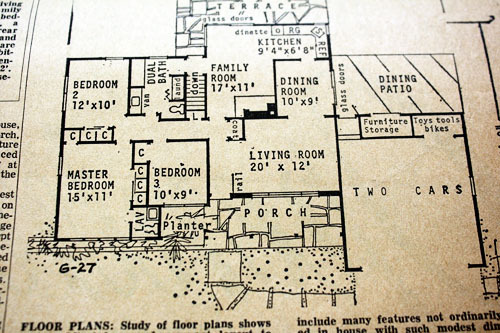 But still, you don’t see many “larders” on floor plans today! 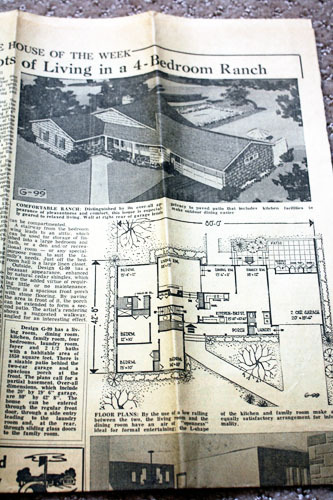 So what if, fifty years ago, you decided you really wanted a house with an envelope roof and an octagonal living room and a larder? 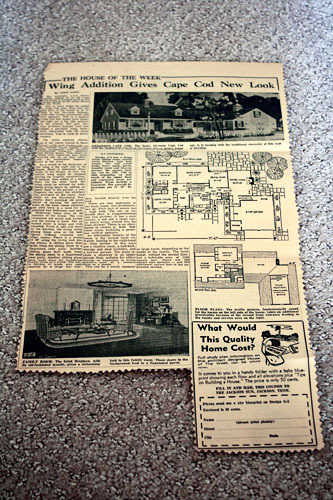 Well, the floor plan could be yours for fifty cents! Mail-order, of course, in the pre-internet days. And don’t you love how the city paper’s office doesn’t require a street address? 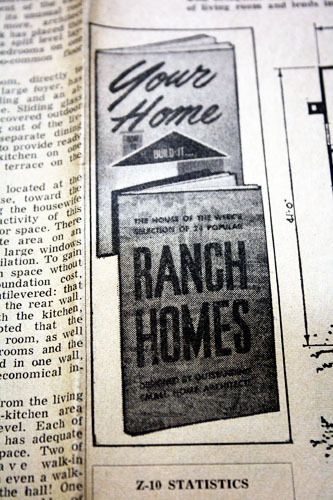 And if you didn’t like any of the Houses of the Week, you could order a book of Ranch Homes! Seriously, how much fun are those? 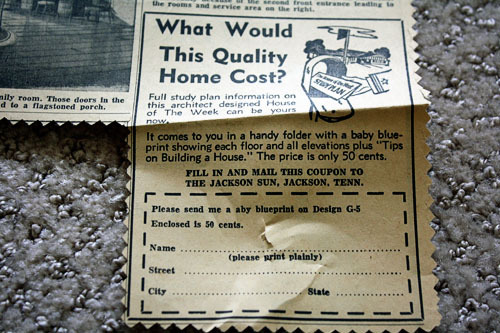 I had a blast flipping through the whole stack, seeing the styles from the past that we’ve embraced and those we’ve cast off, considering how different a world it was then when you could only think about ONE house plan per week instead of the eleventy jablillion on Pinterest today. But now I need your help. What should I do with these? Aside from throwing them away, of course (no). I can always put them in storage, but wouldn’t it be fun to use them somehow? That is, without cluttering up our walls with framed newspapers, like a restaurant showing off its reviews? Hmm. Maybe I should go to Pinterest and look for ideas! 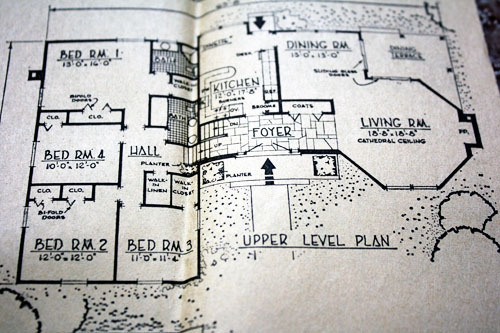 I did love the floor plans!! !